On 1 August Frankel repeated his previous year's victory in the Sussex Stakes at Goodwood. Starting at odds of 1/20 against only three rivals, he won by six lengths from Farhh. With this victory, Frankel equalled the record for consecutive European Group 1 victories (seven in a row) set by Rock of Gibraltar, and also became the first horse to win the Sussex Stakes twice. After the race, his Jockey Tom Queally said: "Every moment spent on Frankel’s back is a special moment. He is amazing and had all the others cooked at halfway. It was a nice prep for his next race. He is a class apart from any other horse around and does it all very easily... Turning into the straight, I slipped him an inch of rein. You don’t have to do much on him. He’s so competitive and he has a will to win like no other horse I’ve ridden." Lord Grimthorpe, the racing manager to the horse's owner, Khalid Abdulla, said: "There are two obvious races for him, the Juddmonte and the Champion Stakes [Ascot, Oct 20], but there is a gap of nearly two months between them, and Henry may decide to give him a race in between, possibly something like the Prix du Moulin [Longchamp, Sept 16]." On 22 August, Frankel won the Juddmonte International Stakes at York. This race was over 10 furlongs and was the first time that he raced over more than a mile. Consequently there was much anticipation as to whether he would stay the extra distance. Starting at odds of 1/10 against eight rivals, he easily won by seven lengths from Farhh, who was a nose ahead of four-time Group 1 winner St Nicholas Abbey in third. This was his eighth consecutive European Group 1 victory, breaking the previous record of seven in a row set by Rock of Gibraltar. After the race trainer Sir Henry Cecil said “It’s fantastic. It’s great for Yorkshire and they deserved to see him.” He was attending the racecourse after missing Frankel's previous win due to ill health and said the win made him feel “twenty years better.”. Frankel was expected to have only one more race in his career, and to stand as a stallion from 2013. Having demonstrated at York his ability comfortably to stay ten furlongs, there was speculation that that there might be a change to his programme, with his final race being the twelve furlong (mile and a half) Prix de l'Arc de Triomphe at Longchamp in October. However on 31st August Lord Grimthorpe said that Frankel's next race would be the Champion Stakes. On 20 October Frankel won the Champion Stakes at Ascot over ten furlongs. The ground was more testing than he had faced hitherto, being soft, heavy in places, and the colt's participation had been in doubt until Lord Grimthorpe walked the course on the morning of the race and gave the go ahead. In spite of losing several lengths at the start he beat the previous year's victor Cirrus des Aigles by one and three-quarter lengths, with Nathaniel a further two and a half lengths back in third. He had attracted a sell-out crowd of 32,000, who cheered him home from three furlongs out. After the race Prince Khalid Abdullah confirmed that the horse would be retired to stud. Corine Barande-Barbe, trainer of Cirrus des Aigles, said after the race: "It was a great day and it was like a victory to make Frankel gallop." Teddy Grimthorpe commented: "The way everyone has reacted to Frankel and Henry has been one of the great sporting stories of the year if not for many years. It was just brilliant and totally deserved." Tom Queally said: "You never see an F1 car win on anything but tarmac but for him to win on ground like that shows how special he is. There was a bigger crowd at Royal Ascot but this was more intense. I don't know what I would have done if he didn't win." 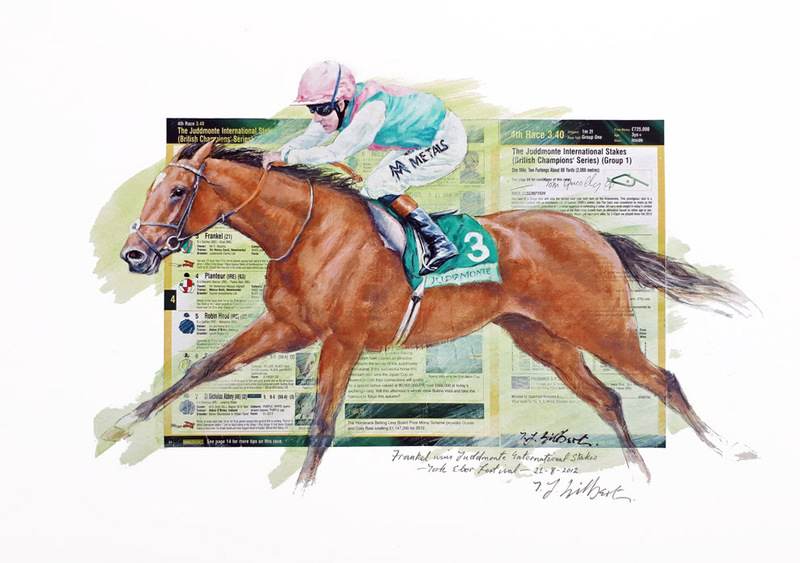 Sir Henry Cecil commented: "He's the best I've ever had, the best I've ever seen. I'd be very surprised if there's ever been anything better."